HP Minitower – Ubuntu 10.04 Installed – Sold! This is about feeling better about eating “bad” food by making some “good” food. As I ate leftovers for lunch last Saturday – delicious reheated take out Chinese – I got into a bit of a funk. What is in that food? How much MSG had I just eaten for the second day in a row? So I decided to make some muffins. 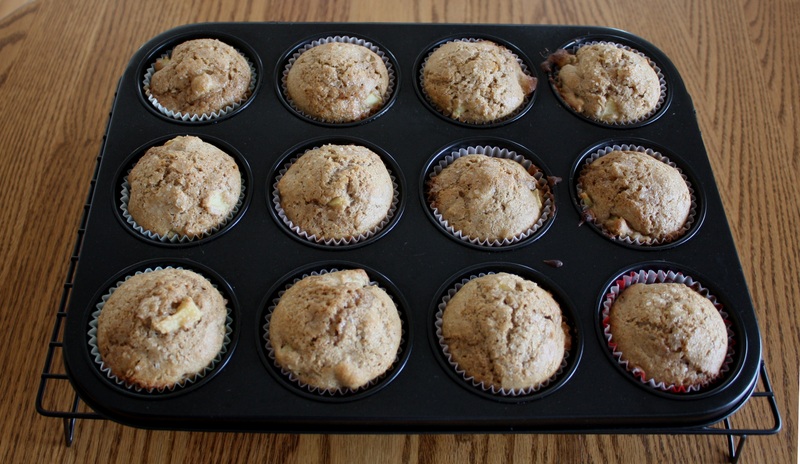 Apple muffins, made from things in the fridge and the pantry. I won’t claim that they are “healthy” as they are made with whole milk and butter, but at least I know what’s going on. And I really hope that Gabe enjoys his afternoon snack! Preheat oven to 400 degrees F. Grease 12-cup muffin tin or use paper liners. With a wire whisk combine first set of ingredients. In another bowl, combine wet ingredients. Add chopped apple and wet ingredients to dry ingredients. Stir only until moistened. Spoon into prepared muffin pan. Bake for 20 minutes or until tested done with tester. Credit goes to baking.about.com for having this simple recipe that had a lot less going on than many of the others I looked at. I added 1/8 tsp course “in the raw” sugar to each muffin before baking. I think I’ll double that for the next batch. Added a good touch of sweetness and little desirable texture. I also used whole wheat flour – today I bought some non-bread white flour for another go at these and will probably do one cup wheat, one cup white to “lighten” them up a bit. This entry was posted in Recipes and tagged muffins on March 1, 2013 by Nat.